Finding a scooter rental for a decent price as a foreigner on Bali isn’t as easy any more. Prices are going up a lot. For Australians it’s very cheap to fly here; for them everything is cheap and they are willing to pay the price. Salesmen will often translate the price – “Only 5 Australian dollars” to rent a scooter for a day. Especially when staying for a month, this is not cheap. Luckily, we got a decent price: around € 2 a day, although it would be possible to find it even cheaper. We got it through a friend who doesn’t normally rent to foreigners. 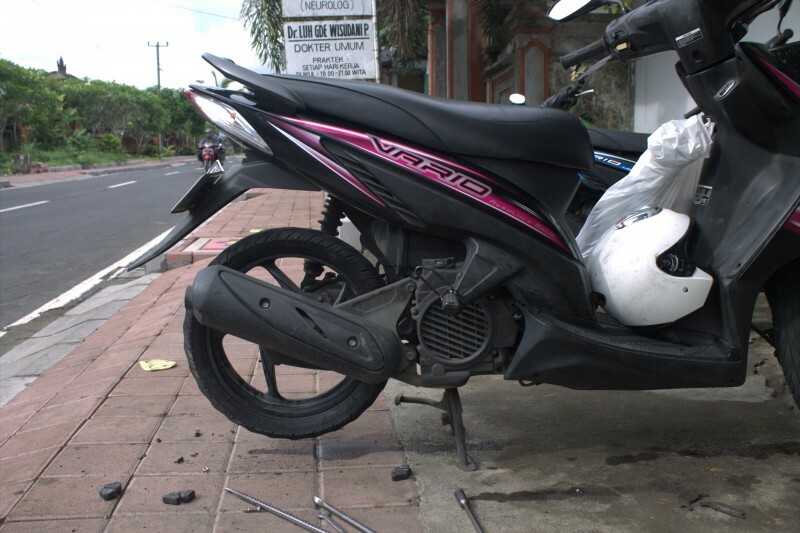 “They drive like crazy.” This is one thing you will recognize, especially in the Kuta area. Drivers cutting people off, never slowing down for a crossing or just unable to drive a scooter in the first place. So, pay attention to tourists on scooters. Anywhere else, just follow the Bali flow. Although we didn’t want to spend too much time around Kuta, we went there one afternoon to look around for a small market. This turned out to be the worst idea we could have. Our scooter nightmare started when we parked the scooter in Legian street, never expecting what could follow. When we returned to the scooter and were about to drive away, I felt the back tire was flat. It was already dark and we didn’t know where to go. One strange guy, who already looked at us as soon as we walked up to the scooter, said possibly someone stabbed the tire. Tina was convinced it was him. We started walking, taking the scooter with us. One guy, working at a karaoke bar, saw us from the open terrace. He pointed on the back wheel like he was already expecting us. He offered as to bring the scooter to a mechanic to get it repaired. Kuta is full of people wanting to take any opportunity to get money from a stranger and Tina didn’t trust him from the start. I wanted to give him a chance anyway. He assured us to take our scooter somewhere nearby. Just 50 meters to the left, he said. There was only a dark, narrow alley. He kept saying it wasn’t far and we could wait and have a beer. It didn’t sound like a reliable idea to just give the scooter away. “Do you know this guy?” Tina asked his colleagues. “Yes, yes,” they said smiling. “How much?” we asked. “No more than 20,000” – a fair price at least. We shouldn’t go there by ourselves, he thought, the place could be closed – but he knows them. Finally, we could convince him to just come with us and lead the way. He took his own scooter and drove in front of us, at walking speed. Balinese would never walk a 100 meters if they can use their scooter. He guided me through a maze of tiny, unlit alleys. Tina followed us with some distance, expecting the guy would beat me up and rob us at the next turn. Nobody else was walking there. If something happens, there would be no one to help us, Tina was surely thinking. She still remained behind us. I knew she was scared. After some turns leading into even darker streets, we were finally released. We arrived at a small home, next to a road by a dirty river. Some mechanics sitting in a living room with just a dirty mattress and an old TV came out and started working on the tire, without any word. The man we followed took a seat there and kept talking to us about his son Dember, who was named after December – as that was the month he was born in – and his hate for Kuta. His English was a bit hard to follow. He noticed Tina was still a bit cautious. The mechanic working on the wheel, seemed to have finished but again, said nothing and kept working on other stuff. Our helping stranger, whos name was Him, quickly paid for the service and refused to take our money. We followed Him back and thanked him. He was a good guy in the end. The next day, we were about to make a small trip. As soon as we drove away, we noticed angrily that the tire was again flat. There was a mechanic around the corner. The guy, still a kid, was fixing some other scooter parts. He didn’t speak English and as soon as he saw the tire, he just started doing his work. He showed us how bad the inner tube was. He put a new one in after he cut up the old one and put that back in as well, probably for extra protection. He was quick and did a good job but for some reason a random taxi driver came up to talk to him and to us. He did speak English and told us the price: 70,000. Taxi drivers are possibly the last persons you can trust around here so I walked up to another guy to pay: 50,000 was the real price. We were able to stay one night at a place a bit outside of Kuta with Regina, a couchsurfer. She rents a small place there. The owner wasn’t happy with having three people in the room but we stayed anyway. The next day, we found a good place in Ubud where we decided to stay as to not get Regina in any trouble. So, I came to pick up the luggage. The owner just came down and looked at me angrily an didn’t want to greet me. I couldn’t reach Regina and went up to the room. Strangely, the room was unlocked. Could the owner have been inside? Our stuff was safe though and I grabbed all our luggage: two big backpacks and two smaller ones. If locals can fit a whole family or a mobile shop on a scooter, then some luggage shouldn’t be a problem either. The best natural sights in Bali are far up North, around the mountains. There are waterfalls, hotsprings, nice views and jungle. From Ubud it’s a two hour drive, an hour less then from Kuta. We started our daytrip early in the afternoon. 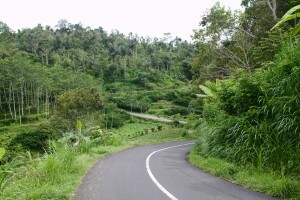 The road up there was nice: barely any traffic; ricefields and jungle all around and mountain roads with great views. Halfway up, we stopped to take some pictures and then it happened again. The tire gave up for the third time and to make matters worse, we were in the middle of nowhere this time. We thought that we would have to push the bike all the way back. However, that was not the case. Destiny sent us a lot of problems with the scooter but at the same time, it also sent us quick help. We couldn’t believe it when we passed a mechanic’s place. We already knew what would come next. Again, we needed a new inner tube but the outer tire was really fucked up, even more than before. There was no other option: We had to get a completely new tire. Unfortunately, they didn’t have any. We decided to turn back home, hoping to make it to the city. Going further meant going through the mountains without any villages and we were running low on fuel as well. We were nervous as strange noises appeared whenever we went through the curves. We feared that things were not going how we wanted them to go. As soon we passed the next village, the scooter began to shake and we had to stop. The tire now was totally damaged. 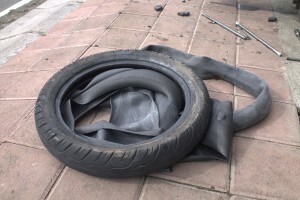 For the fourth time, the tire had to be fixed. Another mechanic wasn’t far. It looked more like a “real” mechanic than all the previous ones so far. A new tire would cost a fortune so we got a second hand tire. Not the best, but at least one without holes. All fixed up again for 60,000. So in the end, our cheap scooter still cost us a lot. I have the same problem at the moment. I rent 3 Scooter in the last ten days and with every scooter I had a flat tire. I hope the next 20 days will be better. I hope you’re well and safe! That’s quite a chunk to pay and it surely taught you a lesson 🙂 Drive slow and careful!